Smoked Ham In Whisky and Mustard - Boiled first to cook and then finished off on the smoker to add flavour. The derivation of the word ham is from the old English "hom" which means knee joint and nowadays refers to the upper hind leg of the pig. Like bacon it is a cured meat whose preparation involved a brine with the addition of salt peter (potassium nitrate) or potassium nitrite which acts as a bacterial inhibitor and has the added effect of turning the ham pink. 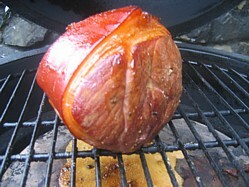 Typically a ham will be brined for a week or more depending on the thickness of the joint, then washed and hung to dry for a couple of weeks prior to cooking. Pork is generally the source of ham although turkey ham is also popular. Not all barbecue ham recipes need loads of time in the smoker and this one makes life really easy (and relatively quick to do) with a little boiling water to start. For quick and consistent results boil the ham first just as you would if you were doing it in the oven because this ensures that the meat stays moist and doesn't dry out. Work on a boiling time of 15 minutes per pound or 30 minutes per kilo. When the boiling is complete it's then time to finish it off in the smoker. Many will of course argue that you don't need to boil first and you can still produce a succulent ham - they're right of course (and the recipe below proves it). It's really a matter of how much time and effort you want to put into the cookout and whether you want to stay absolutely pure to the principle of smoking. Once boiled, remove the ham from the water and allow to cool. Score the skin with a sharp knife to a diagonal cross-hatch pattern taking care not to cut through the fat and into the meat. You're looking to cut through the skin and into the fat....no further. Use a skewer to make holes in the ham and insert the whole cloves at regular intervals. 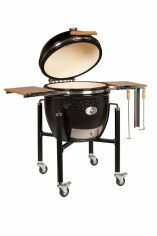 Set your smoker up to run at 110°F or 225°C then place the ham into the meat smoker and cook indirectly for approximately four hours turning at half time. Mix all the other ingredients together to make the glaze and after 4 hours brush all over the barbecue ham and cook for a further 2 hours. Feel free to re-apply the glaze after another hour. TIP - Don’t be tempted to re-apply the glaze too often because every time you lift the lid of the cooker you’ll lose both smoke and heat. If your looking for seriously alcoholic barbecue ham recipes then you've come to the right place! The first stage is to marinate the meat for 2 days followed by a low and slow cookout in the smoker. Note that there is a lot of alcohol in this recipe but if you're not into alcohol, don't worry, it all evaporates during the cooking process, what we're looking for is the flavor of the liquid and not the flavor of the alcohol. After all, alcohol is a bitter taste and is rarely desirable in cooking. Mix all the ingredients in a saucepan, heat gently to dissolve everything and then leave to cool. Prick the ham all over with a skewer, this will allow the marinade to penetrate further into the meat. Place the ham in a glass bowl and pour over the marinade. Marinate for 2 days turning the ham every 12 hours or so and keep everything cool in the refrigerator. When your 2 days are up, remove it from the cure, pat dry (don't rinse) and pop the ham into the meat smoker with the temperature stabilized at 110°C or 225°F Cook indirectly for about 5 hours basting with the remains of the marinade every hour. TIP - Don’t be tempted to re-apply the glaze too often because every time you lift the lid of the cooker you’ll lose both smoke and heat. For the same reasoning, when you re-apply the glaze, do it quickly too. When cooked, allow to cool so that all the juices get locked in and then carve thin slices with a sharp carving knife. Note: - The color of ham that we usually expect is pink and this color comes from the addition of the saltpetre. The addition of saltpetre in this recipe isn't essential and some pink color will naturally occur (the smoke ring) on the outside of the meat as part of the smoking process.